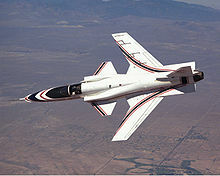 The Grumman X-29 was an experimental aircraft that tested a forward-swept wing, canard control surfaces, and other novel aircraft technologies. The aerodynamic instability of this arrangement increased agility but required the use of computerized fly-by-wire control. Composite materials were used to control the aeroelastic divergent twisting experienced by forward-swept wings, also reducing the weight. The X-29 first flew in 1984 and two X-29s were flight tested over the next decade. Two X-29As were built by Grumman Aerospace Corporation from two existing Northrop F-5A Freedom Fighter airframes (63-8372 became 82-0003 and 65-10573 became 82-0049) after the proposal had been chosen over a competing one involving a General Dynamics F-16 Fighting Falcon. The X-29 design made use of the forward fuselage and nose landing gear from the F-5As with the control surface actuators and main landing gear from the F-16. The technological advancement that made the X-29 a plausible design was the use of carbon-fiber composites. The wings of the X-29, made partly of graphite epoxy, were swept at more than 33 degree forward. The Grumman internal designation for the X-29 was "Grumman Model 712" or "G-712". The X-29A demonstrated high maneuvering and control in flight testing. A maximum angle of attack of 67� was reached. The configuration, combined with a CG well aft of the aerodynamic center, made the craft inherently unstable. Stability was provided by the computerized flight control system making 40 corrections per second. 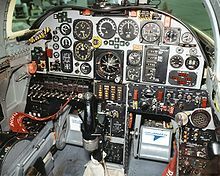 The flight control system was made up of three redundant digital computers backed up by three redundant analog computers; any of the three could fly it on its own, but the redundancy allowed them to check for errors. Each of the three would "vote" on their measurements, so that if any one was malfunctioning it could be detected. It was estimated that a total failure of the system was as unlikely as a mechanical failure in an airplane with a conventional arrangement. In a forward swept wing configuration, the aerodynamic lift produces a twisting force which rotates the wing leading edge upward. This results in a higher angle of attack, which increases lift, twisting the wing further. This aeroelastic divergence can quickly lead to structural failure. With conventional metallic construction, a torsionally very stiff wing would be required to resist twisting; stiffening the wing adds weight, which may make the design unfeasible. The X-29 design made use of the anisotropic elastic coupling between bending and twisting of the carbon fiber composite material to address this aeroelastic effect. Rather than using a very stiff wing, which would carry a weight penalty even with the relatively light-weight composite, the X-29 used a laminate which produced coupling between bending and torsion. As lift increases, bending loads force the wing tips to bend upward. Torsion loads attempt to twist the wing to higher angles of attack, but the coupling resists the loads, twisting the leading edge downward reducing wing angle of attack and lift. With lift reduced, the loads are reduced and divergence is avoided. The X-29 began a NASA test program only four months after its first flight. The X-29 proved very reliable, and by August 1986 was involved in flying research missions lasting more than three hours. The first X-29 was not equipped with a spin recovery parachute, as it was not expected to go into a spin. The second X-29 was given such a parachute and was involved in a high angle-of-attack research program. The NASA test program continued from 1984 to 1991. By the time the first X-29 was retired in 1986, it had been flown 242 times. The first X-29 produced is now on display in the National Museum of the United States Air Force at Wright-Patterson Air Force Base near Dayton, Ohio. The other craft is on display at the Dryden Flight Research Center on Edwards Air Force Base. A full scale model is on display at the National Air and Space Museum's National Mall building in Washington, DC. Winchester, Jim. "Grumman X-29". X-Planes and Prototypes. London: Amber Books Ltd., 2005. ISBN 1-904687-40-7. Grumman X-29 Pictures and Grumman X-29 for Sale.